Mensusa https://www.mensusa.com/articles/the-stylish-look-of-the-pinstripe-suit-is-beyond-comparison.html The Stylish Look Of The Pinstripe Suit Is Beyond Comparison Suits are available in a variety of designs and cuts. But the actual look of a suit depends on the fabrics used to create the suit. There are check suits, solid color suits and others. But perhaps the most outstanding is the pinstripe suit that brings out an individualâ€™s personality. You can also go for the 2 button suit or may be the men's 3 piece pinstripe suit to flaunt your style. Originally, most men wore solid color suits as those were available at all stores. But with the passage of time, and advancement of textiles industry, today there are various types of materials that are used to make outstanding suits. The pinstripe suit has become a favorite of all men who wish to wear a sophisticated look. The fine stripes run in vertical directions to offer a subtle aristocratic appearance to the wearer. Choose the 3 piece brown suit or the men's slim-fit black suits to rock the events. Suits are available in various cuts and fit like the 2-piece or 2-button, 3- button suits. 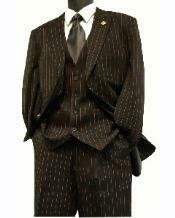 However, the men's 3 piece pinstripe suit available in a wide variety at MensUSA are the best that you can buy. Since the entire suit is made of the same fabric a uniformity is maintained and this offers a highly sophisticated look to the wearer. Various shades of men's pinstripe suit is available of different materials. Choose according to the season that keeps you comfortable throughout the day. You can even match your single color dress shirts with the pinstripe suit to make the stripes more prominent. Every ensemble of the pinstripe suit like the jacket, vest of trousers are so unique that they can be worn singly with other coats or pants and vests. The attire that you choose to wear speaks a lot about your taste and personality. At MensUSA you will get a wide variety of suits for every occasion. Pick out the two button suit according to the occasion and season to flaunt your style. The 2-button suit offer a sleek and smart look to the wearer. You can go for the solid colors or the stripe or herringbone suits. The fabric must be right for the season so that you feel comfortable for long hours. Pick up matching accessories that go well with the suit so that you look different from others. 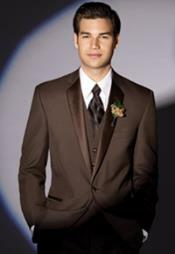 A 3 piece brown suit has a dignified air that gives the wearer a smarter and a more sophisticated appearance. Solid colors especially the brown, black, blue and white have always been the favorite of men of style. Hence when you put on a 3 piece brown suit, you look even more outstanding as the uniformity portrayed in the solid brown color is incomparable. Moreover, a well fitted 3 piece suit enhances your looks especially if you have a good physique. You can wear any color dress shirts and tie with the 3 piece brown suit as all shades compliment the brown color of the suit. The men's slim fit black suits are uniquely designed for stylish men. The fits and designs are so well crafted by master tailors, that a man in these slim fit black suits need no other embellishments to flaunt their style. At MensUSA you will find the best quality men's slim fit black suits of various sizes and fits. Get the one that fits you well to stay in tune to the modern trends. A pinstripe suit is a versatile attire and does not depend on your age. A young lad looks awesome in the boys pinstripe suit. He can match it with his dads suit too as most kids love to imitate their parents. Visit MensUSA to pick up the best fitted boys pinstripe suit from a huge collection available at this store. If required, you can customize the suit also according to the fit.